During the mid 1700’s, the French, and later the British, were the first to build mills near the Falls. Following the American Independence, New York State auctioned off the mile wide strip of land lining the river banks near Niagara Falls. The state encouraged industrial development and the unrestricted use of Niagara River water to power these industries. Niagara Falls became a major center for attracting electrical engineers and power developers. In 1842, Augustus Porter proposed a system of canals to fuel the industries. During the 1870’s, large mills and manufacturing companies were being built along the American shoreline of the Niagara Gorge approximately 0.5 mile down river of the American Falls. 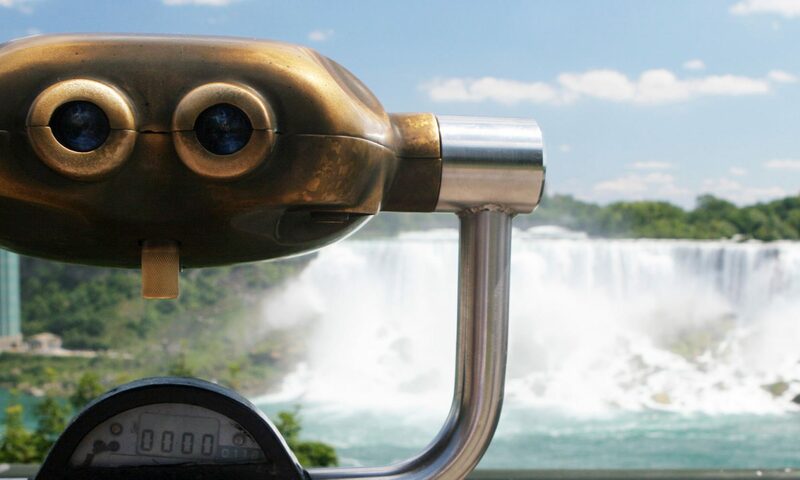 In 1881, the Niagara Falls Hydraulic Power and Manufacturing Company began producing hydro power. The State of New York had a policy that encouraged the industrial development near the Falls. This development was substantial and it soon began to threaten the natural habitat of the Falls and its surrounding environment. Industrialization had turned Niagara Falls into an unsightly blight. Pollution of the air and of the water was common. Until the development of the New York State Reservation Park in 1885, nearly all the shoreline property along the Niagara Gorge and every viewing area of the Falls was privately owned. Following the creation of the Reservation Park, the State of New York continued to entice industrialization with an offer of cheap water power. Niagara mills drew water from the Upper Rapids and not from the Falls. Industries continued to use water-wheels until the turbine was developed. The only large scale development of providing power to the milling district was that of the Niagara Falls Hydraulic Power and Manufacturing Company located in Niagara Falls, New York. The Niagara Falls Hydraulic Power and Manufacturing Company was chartered in 1853. The Niagara Falls Hydraulic Power and Manufacturing Company under the direction of Horace D. Day built an open canal extending 4,400 feet long from the Upper Niagara River at Port Day leading to the mill district located downstream from the falls. This canal was 35 feet wide and 8 feet deep. It carried water into a reservoir located east of the mills. The industries tapped into the water reservoir and with a head of water, only 25 – 75 feet, and then channeled water into their respective mills where water-wheels generated the power to drive the machinery. The canal was completed in 1861. Financial problems prevented The Niagara Falls Hydraulic Power and Manufacturing Company from further development of the mill district until 1875 when new management took over the company and were able to attract various industries to the mill district. Most of the machinery utilized large belts to transmit the power from the water-wheel to the machinery. Water was then channeled by short tunnels bored into the rock of the gorge water to allow its discharge into the river below. This discharge was known as the “tailrace”. Quite often the tailrace fell into the gorge from a considerable height. The tailrace discharge of the many industries became quite a tourist attraction in their own right second only to the Niagara Falls. By 1881, the Niagara Falls Hydraulic Power and Manufacturing Company had built a small generating station and began providing a small amount of electricity to light the Village of Niagara Falls and to provide power to several of the mills. This power plant became a tourist attraction; as well it operated a flour mill for two years before the company went bankrupt. All of its assets were sold at public auction. The first central power station in the Mill District began operation in 1882. By 1885, the mill district industries were generating about 10,000 horsepower which was nearly all the energy the canal was capable of producing. In 1886, the State of New York granted a charter to the Niagara River Hydraulic Tunnel & Sewer Company (later named the Niagara Falls Power Company). Using the plan of Thomas Evershed of the building of a tunnel, this allowed the company to take as much water as it needed for power generation. In 1889, the Cataract Construction Company was incorporated in New Jersey. This company created a large new mill region encompassing 1,580 acres on a two mile tract of land located upstream of the Reservation State Park and the Falls. The Company built a hydraulic tunnel to feed the industries downstream. The tunnel was immense at 6,700 feet long, 21 feet high and 18 feet wide. This horseshoe shaped tunnel which was lined with brick took three years to complete. The Pittsburgh Reduction Company became the first tenant of the new industrial area in 1892. Other industries attracted were the Carborundum Company, Union Carbide, Norton Abrasives and the Natural Food Company (Shredded Wheat Company). The famous Mill District located one mile downstream of the Falls and two miles upstream of the Falls had become an unsightly blight upon the landscape. Pollution once again was a common sight. Smoke and smog hung in the air causing a foul smelling odor. Tall red chimneys were common place, each spewing smoke and soot into the air above the Falls. The industries and mills were unkempt for the most part. Trash and waste piles littered the landscape. Niagara Falls had become an unpleasant place to visit and live. The tunnel district was rundown. Shanty towns sprung up for the workers, where crime and poverty followed. In 1893, The Niagara Falls Power Company built a model city for its employees. The city was named Echota (meaning shelter or a place of refuge). Echota was built on 84 acres of reclaimed swampland. Echota was located along the banks of Gill Creek in Niagara Falls, New York. The streets were named “A” Street, “B” Street, “C” Street, “D” Street and “G” Street. Some of the buildings still exist today. The former Echota subdivision is today located just west of the intersection of Buffalo Avenue and Hyde Park Boulevard near the shore of the Niagara River. The western boundary is Packard Road. In 1897, the Niagara Falls Chamber of Commerce announced that the two mile area between the Falls and the Falls View Suspension Bridge would be developed for businesses and upscale housing. By 1900, Niagara Falls boasted 265 manufacturing plants of all types. The age of electricity converted Niagara Falls into a boom town. By 1900, Niagara Falls was home to 20,000 people. By 1910, the population had increased to 30,000. Four years later, 14,000 people were directly employed in the power generating industry. In the early 1900’s, concerns over pollution became a major issue. The manufacturing companies which contributed to this pollution were ostracized. Henry D. Perky of the Natural Food Company spearheaded a pollution clean-up drive. The result of this drive was the removal of the majority of mills from the famous Mill District along the edge of the Niagara gorge downstream of the Falls over the next forty years.